41. The Duchess of Cambridge's Brooch: This diamond and pearl brooch, made by Garrard, originally belonged to Queen Mary's grandmother, the Duchess of Cambridge. The brooch was inherited by Mary's mother, the Duchess of Teck; she bequeathed it to Mary in 1897. Mary chose to wear the brooch at the 1926 christening of Princess Elizabeth, so it's no surprise that she also decided to bequeath the brooch to Elizabeth in 1953. 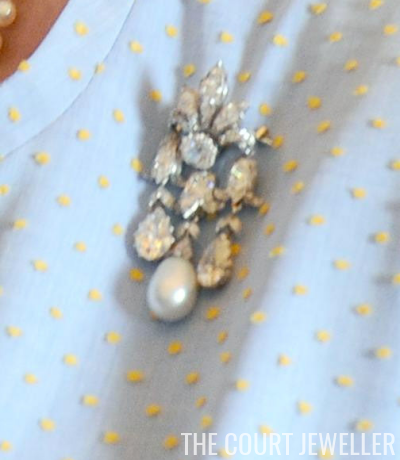 The Queen wears this classic brooch very frequently, both with and without the detachable pearl pendant. 42. Queen Alexandra's Wedding Gift Brooch: Part of the parure given to Alexandra by her new husband in 1863, this diamond and pearl brooch was made by Garrard. Alexandra wore the brooch (as well as the parure's necklace and earrings) on her wedding day. The brooch features three detachable pearl and diamond pendants, and the Queen has worn it both with and without the pendants since inheriting it from Queen Mary in 1953. 43: The Emperor of Austria Brooch: As the piece's name suggests, this brooch was given by Emperor Francis Joseph of Austria to Queen Mary's mother, the Duchess of Teck, in 1870. The diamond and pearl brooch was a gift to mark the christening of Prince Francis of Teck, for whom the emperor served as a godfather. Prince Francis inherited the brooch from his mother, and when he died suddenly in 1910, the brooch (and the Cambridge emeralds) were famously inherited by his mistress, Lady Kilmorey. Hugh Roberts tactfully notes that the brooch was "retrieved" by Mary from Lady Kilmorey, and it was one of the many pieces that she bequeathed to the Queen in 1953. 44. Queen Mary's Kensington Bow Brooch: Although she was a princess from a German house, Queen Mary's mother was a British princess, and Mary was born in Kensington Palace. It seems especially appropriate, then, that the people of Kensington gave Mary a wedding present: this lovely diamond brooch with a baroque pearl pendant, made by Collingwood. Mary wore it at the coronation of her parents-in-law in 1902, and then at her own coronation in 1911. She left the brooch to the Queen in 1953; she often wears the brooch on gala occasions, but she also famously donned it at her mother's state funeral in 2002. 45. Queen Mary's Richmond Brooch: The town of Richmond gave this diamond and pearl brooch, made by Hunt and Roskell, to Queen Mary as a wedding present in 1893. It's quite a large piece, but Queen Mary wore it in various configurations, including at least one time in her hair. The pendant is detachable, and since inheriting the brooch in 1953, she has worn the brooch both with and without the pendant drop. 46. The Women of Hampshire Brooch: A committee of women of Hampshire, led by the Duchess of Wellington, gave this brooch to Queen Mary as a wedding present in 1893. The diamond and pearl jewel was made by Garrard; it was originally intended to be worn as a pendant on a necklace, but Mary had it converted to be worn as a brooch. The Queen inherited the brooch from Mary in 1953. 47. Queen Mary's Lover's Knot Brooch: Queen Mary purchased this large, elaborate ribbon brooch from Garrard in 1932, and she bequeathed it to her granddaughter two decades later. The Queen often wears the diamond brooch on gala occasions. She has also worn it for two very important royal weddings: Princess Margaret's wedding in 1960, and the Duke and Duchess of Cambridge's wedding in 2011. 48. The Cullinan III and IV Brooch: In 1905, the largest diamond ever discovered was found in the Cullinan mine in South Africa. Two years later, the enormous diamond was presented to King Edward VII. Over the next year, the 3100 carat stone was cut and polished into nine major stones. In 1910, the new king, George V, ordered that the largest two stones should be set in the Imperial State Crown and the scepter. The next two biggest diamonds, Cullinan III and IV, were made into a brooch. Queen Mary bequeathed the brooch to the Queen in 1953; she has jokingly referred to the enormous diamond brooch as "Granny's Chips." Fittingly, the Queen chose to wear this brooch during the celebrations for her Diamond Jubilee in 2012. 49. The Cullinan V Brooch: The Cullinan V stone is a heart-shaped diamond; Queen Mary had it placed in a lovely brooch setting by Garrard in 1911. (She also sometimes wore it with her honeysuckle tiara, which now belongs to the Gloucesters.) 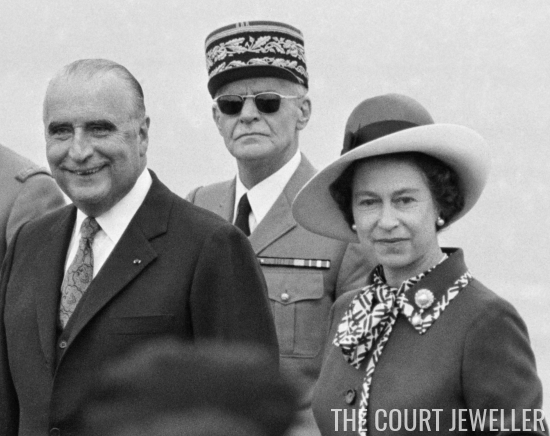 The Queen inherited the brooch in 1953, and she has worn it consistently throughout her reign. 50. The Cullinan VI and VIII Brooch: The Cullinan VI stone belonged to Queen Alexandra privately; she bequeathed it to Queen Mary in 1925. Mary generally wore it linked together with the Cullinan VIII stone, and it was bequeathed in that configuration to the Queen in 1953.